San Sebastian defeated San Beda, 87-72, Monday but not before both teams engaged in a bench-clearing incident at the PCCL National Championship semifinals at the Fil Oil-Flying V Arena in San Juan. The Stags rolled in the second quarter and led the rest of the way to kickstart their campaign in the final four, a round-robin tournament to determine the national champion. But emotions ran high when eight players were ejected led by Calvin Abueva and Kyle Pascual, who figured in a scuffle on a rebound play with two minutes and 10 seconds remaining in the game. San Sebastian’s AJ Vitug, Michael Miranda, Krushev Ferrer and Joshua Grilli and San Beda’s Ryusei Koga and Michael Sorela were also ejected in the match for leaving their respective benches. Security personnel quickly came in to separate players from the two teams to prevent any further untoward incident. The game was days removed from an incident between both schools when San Sebastian women’s volleyball coach Roger Gorayeb was punched in the eye during a melee with the San Beda men’s basketball team last week during the NCAA women’s volleyball tournament. Aside from security, policemen were also deployed in the venue, as requested by league organizers, to avoid any incident from happening in and out of the playing court. Robinson also apologized for the melee. “It was also on me that I wasn’t able to control my players,” he added. San Sebastian got a measure of revenge after being swept in the NCAA finals by San Beda, which played without Garvo Lanete, Jake Pascual, AJ Semerad and David Semerad for various reasons. “It’s agood to win after the NCAA finals. But we can’t discredit the hearts of the players who were left. 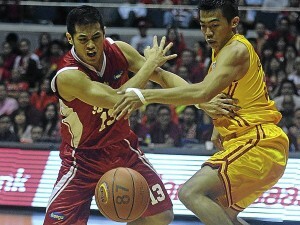 San Beda gave us a good fight despite missing several of their key players,” Robinson said. Ian Sangalang tallied 20 points, 12 rebounds, three assists and a block while Abueva had 19 points, 10 rebounds and five assists. Ronald Pascual had 15 points before leaving the game with an injured left knee. Rome Dela Rosa had 13 points while Melo Lim added 10 for the Red Lions. 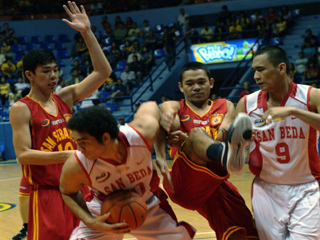 Dave Marcelo had seven points and seven blocks for San Beda. San Sebastian and San Beda, the 87th NCAA finals protagonists and two schools that got involved in an ugly incident last week, renew their bitter rivalry as the Philippine Collegiate Champions League Final Four starts today at The Arena in San Juan. The Stags and the NCAA champ Lions hit the court at 4 p.m. in their first duel since a highly physical best-of-three showdown in the NCAA cage wars. Some see extra fireworks in the showdown, three days since the Red Lions basketball team of coach Frankie Lim and the Stag’s volleyball squad figured in a brawl in the NCAA’s volleyball competitions at the SBC gym, leaving SSC coach Roger Gorayeb and libero Mae Crisostomo with swollen faces. Although the theme of revenge for a comrade is apparently in the air, SSC’s basketball mentor Topex Robinson isn’t going to turn this match into a “basket-brawl” with the Lions. Another old rivalry explodes in the 2 p.m. curtain raiser as giants Greg Slaughter of UAAP four-peat champion Ateneo and Junmar Fajardo of CESAFI victor and Southern Island titlist University of Cebu lead their respective teams. The 6-11 Slaughter and the 6-10 Fajardo pick up from where they left off in the CESAFI, Cebu’s prominent varsity league. Slaughter starred for University of the Visayas and disputed cage supremacy in the Queen City of the South against Fajardo prior to transferring to Manila to join Ateneo. Slaughter spearheaded the UV Lancers’ three-peat romp in the CESAFI and continued his winning ways with the Eagles in the UAAP. Fajardo was left to dominate, leading the Webmasters to back-to-back titles. NBA legend Alex English is here to train Petron Blaze’s big men, but he was impressed with how the Boosters guards performed against Alaska Tuesday night. The 17-year NBA veteran arrived the other day for a job as a skills coach of the team, particularly the frontcourt of the Boosters. “I like the energy of the team, especially the point guards, and how they put the ball on the floor while also maintaining a pressure defense,” said English, pertaining to the hustle plays of Alex Cabagnot and Dennis Miranda in Petron’s 90-85 win against the Aces. 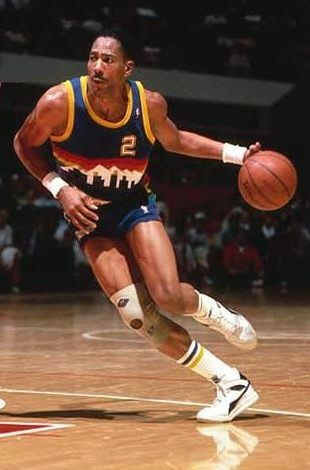 English, an electric scorer for the Denver Nuggets who was inducted to the Basketball Hall of Fame in 1997, is taking the skills coach spot from another NBA veteran, Alton Lister, who moved to Meralco prior to the season. He stressed the importance of players’ understanding the roles to have a successful team. “We didn’t have many superstars when I was playing for the Nuggets,” he said. English also shared his excitement on the pending end of the NBA lockout. San Miguel Corporation basketball operations head Robert Non said English is signed to a two-month contract. San Beda Red Cubs won 19th NCAA juniors Basketball Title after beating CSB-La Salle Greenhills Greenies. Francis Abarcar made sure he and the other graduating senior members of the San Beda Red Cubs end their 87th NCAA season as winners. Abarcar scored nine of his team-high 18 points to guide the Red Cubs to their third straight juniors crown with a 69-61 win over the CSB-La Salle Greenhills Greenies in Game Three of the championship series Thursday at The Arena in San Juan City. 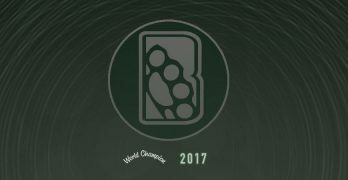 “This was the sweetest victory of our last three championships since we only had six holdovers from the champion team last year. 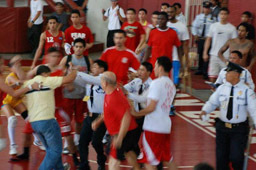 We really worked hard to win this title,” said San Beda coach Britt Reroma, the author of the Red Cubs’ last two titles. Abarcar also had seven rebounds, two assists and blocked one shot to earn the finals Most Valuable Player award. Reroma made true to his promise of ending the title series and give San Beda its 19th overall crown in the high school basketball tournament. Limuel Patenio sparked an 11-3 as San Beda enjoyed a 10-point spread, 41-31, with still four minutes and 44 seconds. A three-pointer by Daryl Nazarano, who finished with 10 points, in the 6:37-mark of the final period hiked the Red Cubs’ lead to 60-43. LSGH trimmed the lead to eight, 65-57, but time was not on the Greenies’ side as there are only 74 minutes left in the game clock. Thomas Torres led the Junior Blazers with 25 points, eight rebounds, five assists and one steal but failed to get the needed support from his teammates. 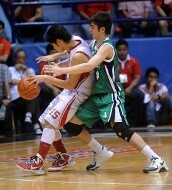 Mario Bonleon and Jon Villaruz, the Greenies’ other top gunners, were held to nine and eight points each. LSGH also missed the services of Angelo Vito as the National youth team member failed to finish the match after injuring his left knee 2:51 left in the opening period. San Beda Red lions bags NCAA seniors men’s crown after beating the San Sebastian Stags 57-55, sweeping the series 2-0. The Red lions were back-to-back champions once again. It was a low scoring ball game, it just showed that both teams played hard on defense. The Stags were leading majority of the game, but the Lions woke up and made a run to grab the lead. Garvo Lanete was still struggling on the game but manages to create what could have been the best play of the Finals, driving right to the basket then passing the ball to an open team mate for an under goal stab. Dave Marcelo was named Finals MVP. San Beda steals Game1 of NCAA Finals 75-63. Jesmar Villahermosa played the hero of the ball game scoring timely for the Red Lions. Villahermosa, the former USJ-R Jaguars, lead the way for the Red lions scoring 15 points in the grandest stage of Men’s baskeball the NCAA finals. “I needed to do this because it’s the finals already. Coach (Frankie Lim) told us to bring our A-game,” said Villahermosa. Jesmar is playing for his last year for the San Beda Red Lions. Garvo Lanete was struggling in the game can’t get his rhythm scoring a season low six points. It was very unlikely for the Red Lions top scorer (Lanete). Good thing the bench players were there to the rescue. Big man Dave Marcelo, made his presence scoring 14 points and pulling down 11 rebounds and erasing two shots. Ronald Pascual and Calvin Abueva lead the way for the Stags scoring f 14 and 12 points, respectively. The Sebastian Stags are hoping to bounce back from their loss.